It's that time again when Adobe announces yet another update to its Camera Raw software plug-in so that the increasing number of photographers shooting in raw can squeeze every last drop of image quality from their shots before editing in Photoshop or Lightroom. Each release of ACR includes compatibility of the very latest slew of digital cameras, including the Canon EOS 5D Mark III, Sony Alpha 37 and Pentax K-01. This latest update will only install if you have Adobe Photoshop CS6 already running on your PC or Mac. This restricted update policy, whereby users of previous versions of Photoshop are shut out of updates, has been a constant source of irritation to many Photoshop users who may not feel they need a costly upgrade in order to access raw file compatibility with newer cameras. 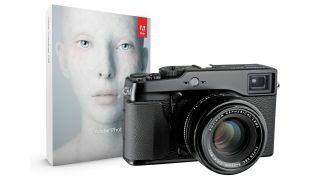 Version 7.1 of ACR offers compatibility with a host of new cameras including the stunning Fuji X-Pro1 compact, so it's probably fair to say that the money to upgrade Photoshop is unlikely to be a significant hurdle for anyone who can already afford to spend £1,500/$1,700 on the X-Pro1 body alone. Because the Fuji X-Pro1 uses a non-Bayer type of colour array filter in front of its full-frame sensor, its raw files require more sophisticated decoding of the information compared with more conventional digital cameras. The new plug-in promises to extract all the quality stored in those raw X-Pro1 image files, and for that reason it's an essential upgrade for all those who've taken the plunge and invested in Fuji's latest 'old-school' digital compact camera. As well as offering compatibility with the latest cameras, ACR 7.1 also incorporates the advanced defringing tools that were first seen in the Release Candidate version of the software. The defringing feature helps reduce chromatic aberration, the purple and red fringe that can sometimes appear at the edge of digital images, particularly those shot with wide-angle lenses. Announced alongside ACR 7.1 is the latest version of Lightroom 4. This incremental update to 4.1 offers some stability features and compatibility with certain Nik plug-ins that refused to work with the original Lightroom release. And if you're not planning on upgrading to Photoshop CS6, do remember that Lightroom 4 is a far cheaper way of getting your hands on Adobe's Camera Raw plug-in.